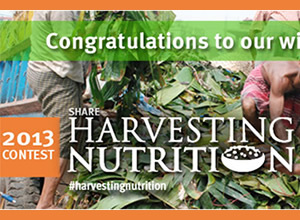 The Harvesting Nutrition Contest award ceremony on February 19, 2015 showcased three agriculture-nutrition projects that demonstrated outstanding innovation, potential for impact, or scalability. Ag2Nut members often make or receive requests for case studies of "what works" in agriculture-nutrition programming, and this call gave the community an opportunity to dive in. Jim Levinson, Research Professor from Tufts, moderated a discussion on key insights from the Harvesting Nutrition event, including how the winning projects seem to be achieving success and how their lessons learned can be applied in different contexts. Nutrition Specialist at the World Bank and SecureNutrition team member Andrea Spray attended the call to provide an overview of the contest; she managed the award selection process and was a co-producer – with photographer Andrea Borgarello - of the multimedia profiles of the award winning projects. The representatives of the winning projects also spoke: Theresa Ampadu-Boakye, Ilse de Jager (both N2Africa - Watch Video), Danny Harvey (RAIN project - Watch Video), and Anne-Marie Steyn (Shamba Shape Up - Watch Video).